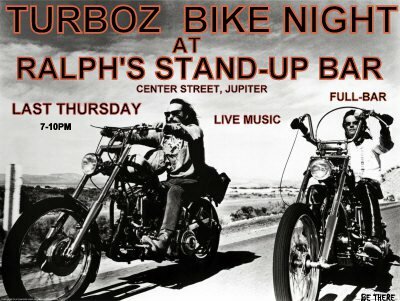 Turboz Bike Night at Ralphs | Turboz Custom Cycles Inc.
Come out to join us on Thursday, April 26th at 7 PM. The last Thursday of every month is Turboz Bike Night we get together with a group of friends to just hangout and have a good time. Everyone is welcome, join us at one of the longest standing Bike Nights in Northern Palm Beach county and have a good time with like minded good people.